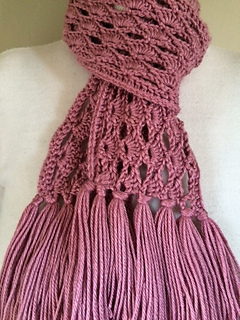 in 3 shells = 4"
Simple but beautiful lace scarf, great for any season. Using V-stitches and shells to create a delicate pattern. 1 skein of Caron Simply Soft in Victorian Rose. This pattern can be found under the Simple & Sensational section of the free patterns on the website. Or go to the Site Map located at the bottom right page for the full list of patterns available on the website.